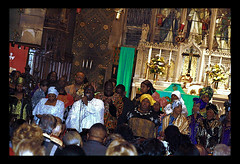 The African Episcopal Church of St Thomas Gospel Choir had a CD release party the other week. This was their 4th CD release. They are based in Philadelphia., and from what I understand have toured internationally. Anyways, that built in light wasn't sufficient enough, so a little tweek of the ISO speed here.... and shutter speed there, I did manage to capture a couple nice images. Needless to say, my tax rebate DID finally come, and I was able to get that external flashbulb to mount on the camera for these kinds of light situations. (which by the way is a necessity in my field of work) I don't want Bahiyah scolding me :) She offers sound financial advice and tips. If you remember the old commercial.... "When E.F. Hutton speaks... people listen" So I always check her blog to see what good advice she's offering... and hey, she's even published a book.